Voltaire wasn’t wrong when he said, “The perfect is the enemy of the good.” The pursuit of perfection can stifle progress. Perfection is impossible to achieve. What may be perfect to you may not be perfect to anyone else. Recently we launched our new website. We should have gone live a few days sooner than we did, but we spent extra time tweaking content and graphics to get the best possible representation of what we do. On our planned launch date, the site was in great shape and it could have been published on time. Don’t misunderstand, I am not suggesting that we produce sub-par product; we would never do that. But how much did it matter whether we said “grow” or “expand”? 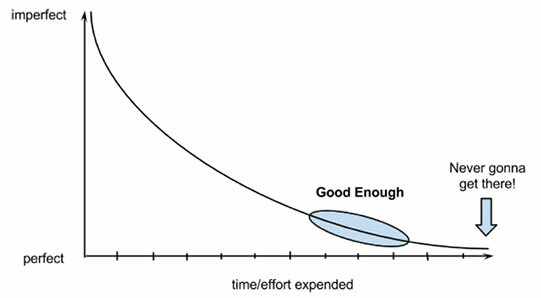 Was the incremental (and subjective) improvement worth the few extra days that could’ve been devoted to working towards other goals? In some cases, getting as close to perfection as possible is demanded. But in most cases, good enough may just be perfect. Hello, i feel that i saw you visited my site thus i came to “go back the favor”.I’m attempting to find things to improve my web site!I guess its good enough to use some of your concepts! !